Leashes provide us with a means to communicate and control our furry friends. But, not all dogs or puppies love leashes…at least, not in the beginning. How Do You Deal With a Puppy or Dog That Doesn’t Like Leashes? One of my veterinarian friends just got a puppy that hated her collar! She spent close to 3 weeks throwing herself on the ground and scratching her collar. I probably wouldn’t want something around my neck and to be pulled around, either, but leashes are a necessary evil when it comes to dog ownership. So, what do you do when your puppy or dog hates his leash? The worst thing would be to avoid it! Life is full of having to do things we don’t want to do. I don’t like getting up early. I don’t like paying my bills. But I have to deal with all of those things. Please don’t avoid everything your dog doesn’t like. Instead, it is best to get him used to it and teach him how to deal with it. PUT THE LEASH ON HIM ALL THE TIME!!! I want you to put his leash on him in the house and let him drag it around for a bit. What most puppies and dogs dislike is being pulled around. By allowing him to drag the leash around for a bit, he gets used to it being on and becomes desensitized to it. 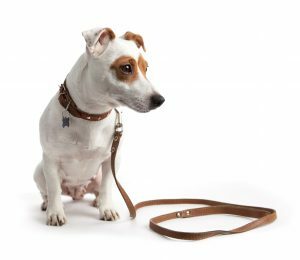 Once the puppy gets used to dragging the leash around and is no longer bothered by it, you can begin picking up the handle and putting some pressure on the leash. If you are clicker training, and I certainly hope that you are, you can click and reward. Once the puppy is no longer bothered by a little bit of pressure, you can begin adding more. I like taking my puppy outside with his leash on. I can pick the leash up or let the leash drag as I play with him. If you have an older puppy, or an adult dog, and they are unwilling to walk on their leash, be sure there are not any physical issues that are causing any type of pain. Dogs are great at hiding their pain! Once pain has been ruled out as an issue, you will need to patiently help him overcome any fear he has about being on a leash outside. Follow the above steps outlined for a young puppy to help your older puppy, or adult dog, to get used to the leash and be comfortable with it. Leash manners and leash etiquette is a huge part of a dog’s life, start them out right! After a few days, you and your puppy will forget he ever disliked his leash!